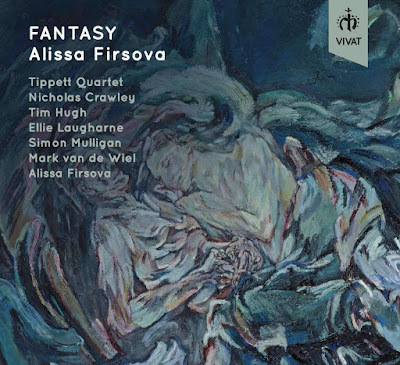 This new disc from Vivat is something of a portrait of composer Alissa Firsova. Under the title Fantasy, the disc presents us with music in a variety of forms, both chamber music and song, Tennyson Fantasy, Op.36 for string quartet, Bride of the Wind, Op.34 for piano duet, Expressions, Op.9 for clarinet and piano, Loss, Op.10 for clarinet quintet, Paradise poems, Op.22 &26 and Fantasy, for cello and piano, Op.29. The performers are the Tippett Quartet, Firsova herself as pianist, joined by Simon Mulligan for the piano duet, Mark van de Wiel (clarinet), Tim Hugh (cello), Ellie Laugharne (soprano) and Nicholas Crawley (baritone). 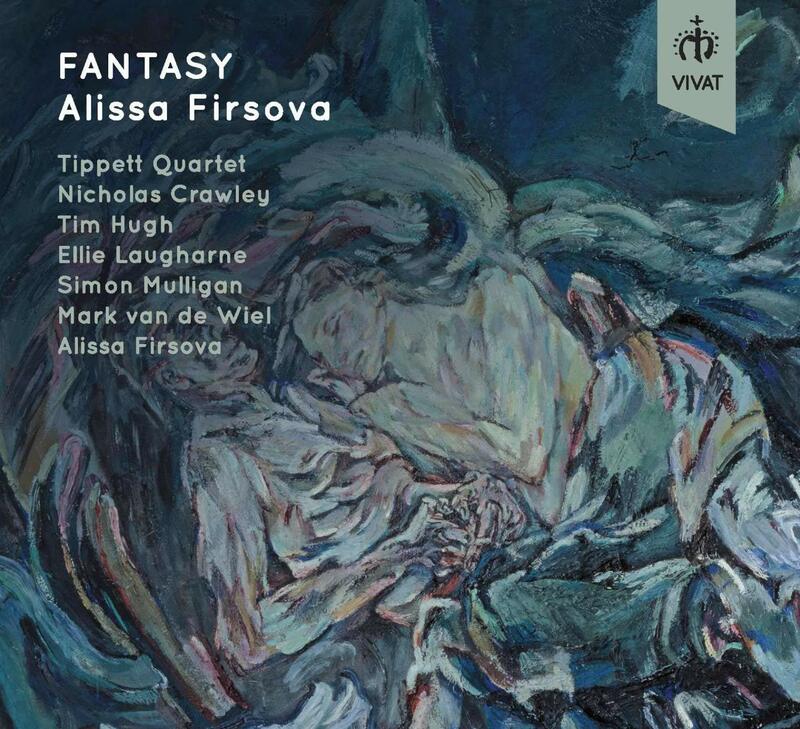 The disc opens with Firsova's Tennyson Fantasy, written for the Tippett Quartet in 2016. Like most of the music on the disc, it takes poetry as its inspiration, here four poems by Tennyson. The opening movement arises out of 'Come down, O maid' from The Princess, a romance with a shepherd singing to a princess which Firsova creates as a lyrical pastoral with bittersweet harmonies, and moments of great intensity. The second movement scherzo is based on 'Ring out, wild bells' from In memoriam, opening all strong attack, firm rhythm and anger, with a trio section using the 'Choric Song' from The Lotos-Eaters, a cello solo of pizzicato which gets rather eerie. For the final movement, we return to In memoriam, a passacaglia in response to 'If Sleep & Death be truly one', to which Firsova gives a sustained, evocative, transparent texture with moments of intensity, which evaporates at the end. Next comes Bride of the Wind for piano duet, inspired by one of Oskar Kokoschka's love letters to his beloved, Alma Mahler. It is a terrific piece with much imaginative writing for the two pianists, mixing impressionistic wash with big dramatic chords and delicate yet complex textures, which can all be interpreted as a single movement sonata form, yet which evokes the storm of their love. Premiered by the Francoise-Green piano duet in 2016, it is here recorded by Firsova and her teacher, Simon Mulligan. The next three pieces come from a larger sequence of works featuring the clarinet. Expressions for clarinet and piano consists of two short movements, Eternity and Awaiting, both try to express the inexpressible. The first has a long-breathed clarinet tune of elusive piano writing, the second a mobile, febrile texture. The final work in this group is the clarinet quintet Loss which was premiered by Mark van der Wiel and Endymion in 2006. It is a single movement work which starts with a string introduction where Firsova's writing reminds me very much of Tippett, she embeds the clarinet in this texture, gradually developing intensity till we reach a mini clarinet cadenza, then the lyricism of the opening returns. Paradise Poems sets a pair of poems by the American-Parisian philosophical poet, Peter Wolrich, whom Firsova met whilst in residence at the Chateau of Canisy in Normandy. Both songs, the first for soprano (Ellie Laugharne), the second for baritone (Nicholas Crawley), try to express the search for paradise on earth, and Firsova combines lyrical rapture in the voice with evocative piano writing. The lower tessitura of the second song adding an element of drama. I have to confess that I found the poems rather intractable and was impressed that Firsova could create something so wonderfully atmospheric. The final work on the disc is also inpsired by a Peter Wolrich poem; Fantasy for cello and piano was premiered by Tim Hugh in 2014. It is a powerful work, rapturous and intense, with a singing line from the cello which we can enjoy without worry about the words. The CD booklet includes an illuminating essay by Firsova, introducing both the music and her inspirations, and as well as the texts for the songs we have the poems which inspired the instrumental items. The performances are all excellent, and this disc forms a fine introduction to the evocative and lyrical music of this talented young composer. Alissa Firsova - Fantasy, for cello and piano, Op.29.